Swechha and Nokia Siemens Networks together present the Yamunotsav 2008 which seeks to catalyze this very process through a confluence of Environment, Art and Innovation. It is an occasion to bring together environment enthusiasts, artists, bureaucrats, media, corporate houses, civil society leaders, friends and patrons to acknowledge and celebrate the powerful combination of people’s enthusiasm and energy, mixed with the knowledge and potential of the civil society leaders, and wisdom on issues of environment. The event would commence with a Debut performance by Phi(re), a young band from Vasant Valley School followed by the launch of Green the Gap – a one stop shop for environment friendly goods, services, and solutions. Amidst re-creating an aura of music, trees and thoughts, Yamunotsav 2008 brings to you a Special address by Sunita Narain, Director, Centre for Science and Environment. 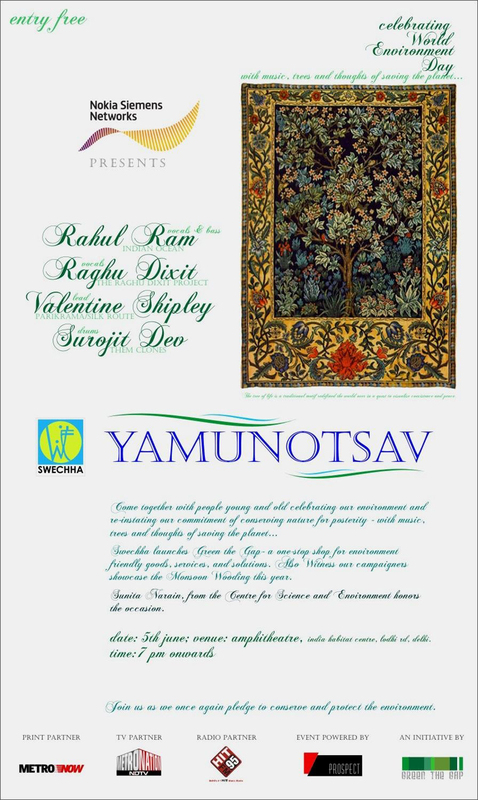 For the first time ever Raghu Dixit, Rahul Ram (Indian Ocean), Valentine Shipley and Surojit Dev (Them Clones) would jam together with Yamunotsav to celebrate the cause of Environment.